Arsenal are ready to sacrifice Hector Bellerin to help fund their squad rebuilding plans. But the Gunners will place a £50million price tag on the talented right back as they prepare to listen to offers for the Spaniard this summer. Bellerin is viewed as one of the brightest prospects in European football and was a target for Manchester City last summer. 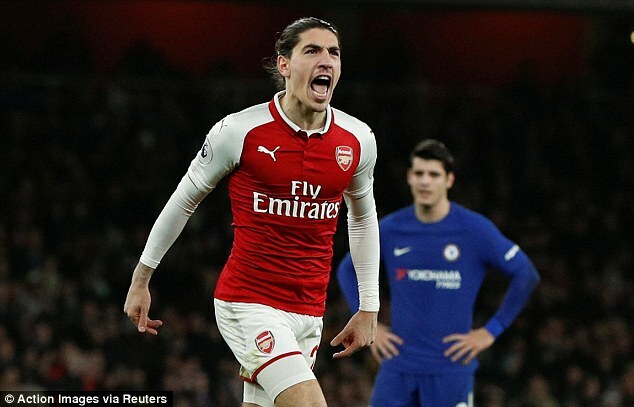 At the time, Arsenal steadfastly refused to consider selling the defender; however, the Gunners are coming round to the notion of selling Bellerin in a bid boost the club’s transfer coffers. Juventus have a concrete interest in the 22-year-old and are understood to be preparing a summer swoop. Whether Pep Guardiola would consider reviving his interest in the Spain international having signed Kyle Walker last summer remains to be seen. Barcelona, the full back’s boyhood club, have also shown an interest in Bellerin in the past. Bellerin, it is understood, would consider a move away from the Emirates Stadium the summer should the right opportunity present itself. Arsenal know selling Bellerin would significantly boost the money available to spend on new players ahead of next season. Head of recruitment Sven Mislintat is keen on making at least three new signings this summer – a goalkeeper, holding central midfielder and centre back. The club are also keen on finding a long-term replacement for left-back Nacho Monreal. Meanwhile, club record signing Pierre-Emerick Aubameyang has revealed the reason he signed for Arsenal was to work with Arsene Wenger. The Gabon striker said: ‘I think we take the manager for granted, I am really happy because I am here because of him.